Did you know that the term “living room” in American lexicon came as a result of a movement to change the name of the public room at the front of a private house from “death room”? 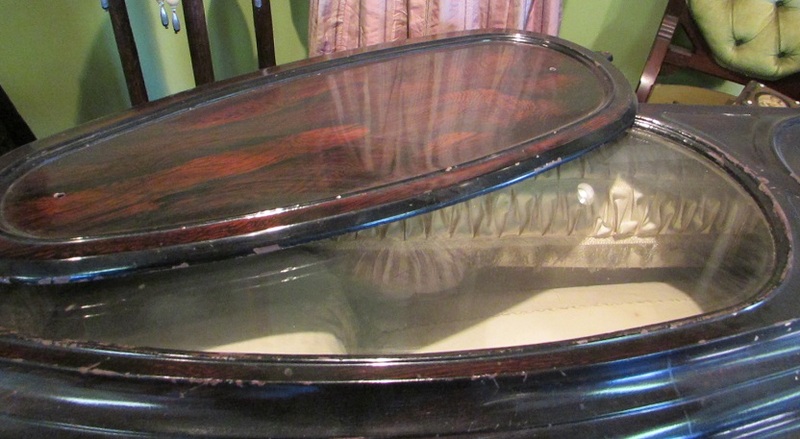 Pre-20th century, the dead were laid out and the funeral held in the parlor of the family home. As a result, parlors were often called death rooms. With the advent of commercial funeral parlors in the early 20th century, the Ladies Home Journal circa 1910 decreed that death rooms and parlors would henceforth be called living rooms. And apparently, as Ladies Home Journal has written, so shall it be done. Much of the collection deals with clothing. The clothing customs for mourning that we in the States follow, even to this day in some measure, were formalized in England in the 19th century. And we all know that it was Queen Victoria who made mourning “popular,” after the death of her husband in 1861 put her into deep mourning for the rest of her life. Men simply added black gloves and/or pins and/or arm bands to their regular black suits. 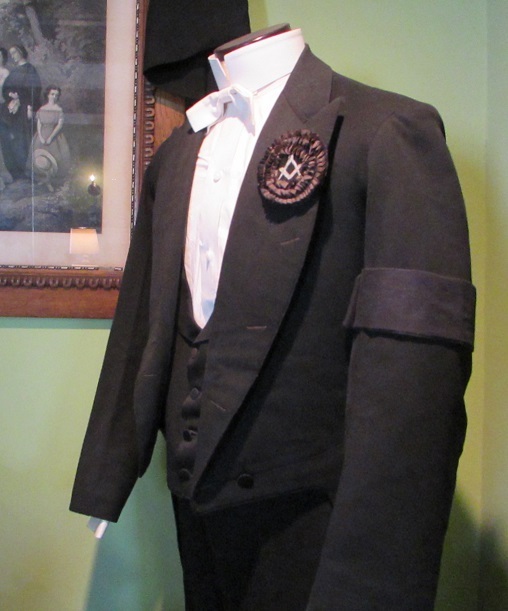 The man who owned the suit, below, was mourning a fellow Mason. The requirements for women were more elaborate. A woman wore black for a period appropriate to her relationship with the deceased, then graduated to lighter but somber colors. I watched the beginning of Gone with the Wind last night, with the scene where Scarlett objects to wearing mourning for her unmourned (by her) late husband. 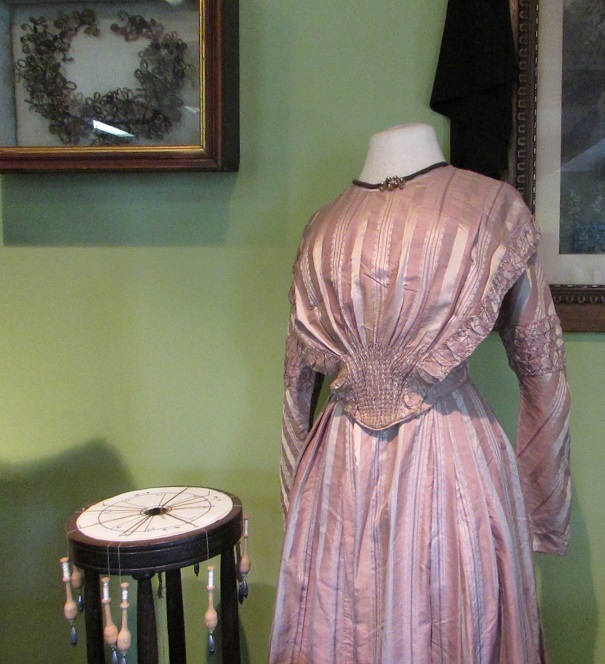 If she’d had the patience to wait a year, she would have graduated to the lovely mauve semi-mourning dress, below. The little round white topped table, with the spools hanging off of it, is a weaving table. It was used to weave the hair of the deceased into jewelry and other ornaments. The wreath on the wall is made of hair that obviously belonged to several people. The docent said that sometimes the hair was saved to eventually make a “family” wreath and sometimes they just added to the wreath as each person died. Eww. 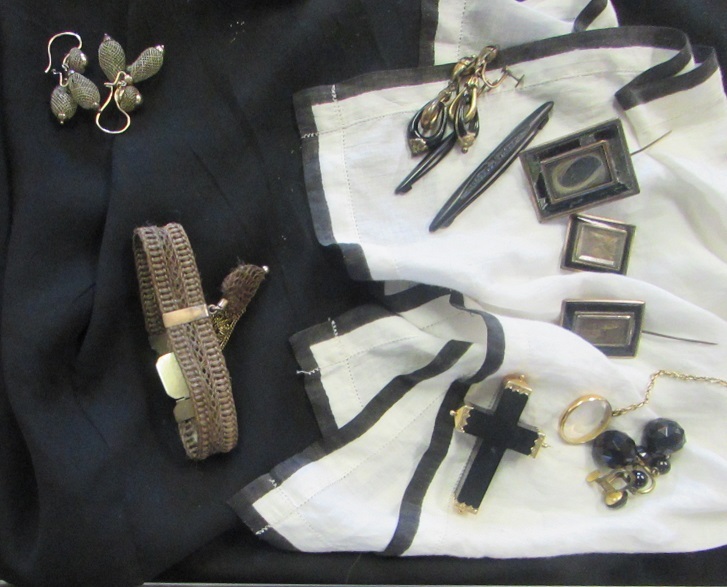 The bracelet and earrings on the left are made of hair. Jewelry made of the hair of the deceased was the only ornamentation a woman was allowed at certain points in during her mourning period. Again: eww. The exhibits reminded me that the customs we have now — wakes and viewings, wearing black at funerals, and lockets filled with hair — are linear descendants of the Victorians. When you visit, take note of how closely your experiences with modern mourning culture relate to those of the past. The museum is in one room of a building that it shares with a research library of cemetery records and the offices of the cemetery and of the Southern Memorial Association. The museum is available to visit only when the offices are open, so check their website before you go. They open for a few hours every day April through October, but are closed during the winter. Gallery | This entry was posted in Virginia and tagged Lynchburg, mourning, mourning jewelry, Old City Cemetery. Bookmark the permalink. It was very interesting. It’s the only museum dedicated to mourning history I’ve ever come across. Fascinating. That is a great story about the ‘living room’. Very Bill Bryson! I’d actually spend a discernable part of my live wondering about the origins of the term “living room.” So it was nice to learn where it came from. I love Bill Bryson! His “Walk in the Woods” is one of my all time favorite books. Loads of lunch-losing exhibits there. What a neat little exhibit! The museum in Kalamazaoo, Michigan has some very elaborate hair decoration, more like a wall hanging that sits in one of those convex glass frames, if I remember correctly. It was quite beautiful. I was at a charity event a while ago, and one of the activities was to have a representative from a local (very prestigious) auction house appraise family heirlooms. One of the items was a piece of jewelry. He looked at it closely and wrinkled his nose. “It’s made of hair!” he said in the same tone of voice I’d use to tell my husband that the cat had used a plant as a litter box. Apparently his expertise was in another area. That is too funny. I’d think that anyone in the auction business would be excited by mourning jewelry, but I guess not.